When a new Apple iPhone goes on sale, usually brings out some international company soon a gold cap for the iPhone or even get to the Apple phone bathe in gold. 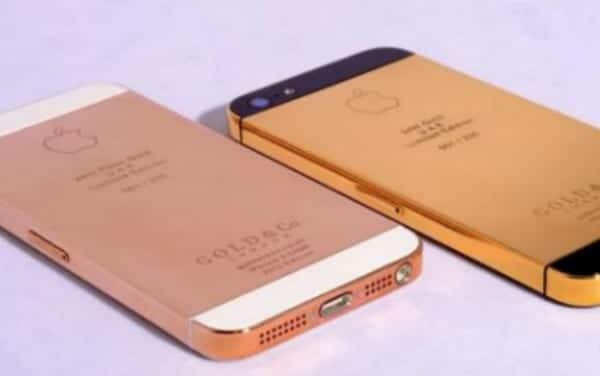 Following the launch of the iPhone 5, the British firm Gold & Co, based in London, has announced that it will release an iPhone 5 gold plated. As can be seen in the image, the gold plating would apply mainly to the edges of the new Apple smartphone and rear metal would be replaced by this precious material. The Golden iPhone 5 will go on sale in Dubai, but its price has not been disclosed. In the past we have seen gold iPhones coming to reach $ 1,224. If the iPhone 5 is already a valuable by itself, will have to be very careful with your phone the person who takes this unique piece of Gold & Co. Article A gold iPhone 5 was originally published in News iPhone .